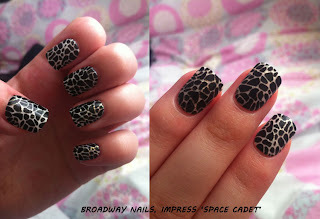 GlitterPolish: Broadway Nails Impress, Space Cadet - review! First of all let me say that I LOVE these false nails! I've never tried any before now because I was a bit cautious of the whole nail glue side of things, but the best thing about these nails are that they don't require glue! I picked the 'Space Cadet' design which is beautiful and sparkly (without being tacky). The instructions on the back of the box were easy to follow. The box contained a full set of nails for both hands as well as extras, as you have to chose the right size for each nail. There was also a wipe to clean your natural nails before applying the false ones to ensure they applied correctly. I've had them on for a day now and so far they've lasted perfectly, even after doing everyday tasks (washing up, doing my hair, carrying/moving things, etc.) The box claims they can last for up to a week and I'm pretty sure they will :) I'm definitely going to buy them again and they're currently £8.99 in Boots!